“America's Reunion on the Mall,” Histories of the National Mall, accessed April 23, 2019, http://mallhistory.org/items/show/421. This festival celebrating American cultural diversity was held on the days leading up to the first inauguration of President Bill Clinton. It was organized by the Inaugural Committee, with support from the Smithsonian Institution, the Library of Congress, and the National Park Service. Three food tents offered cuisine from all over the United States. 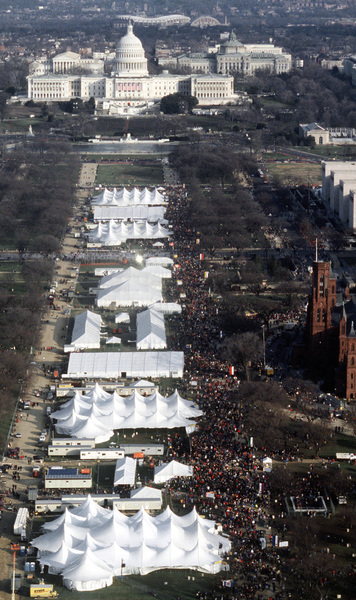 There were multiple stages where musical performances were held throughout the day for all three days of the festival, as well as a kickoff concert at the Lincoln Memorial headlined by major artists including Michael Jackson, Aretha Franklin, Ray Charles, and Michael Bolton. National Archives at College Park. View original.